The thing about having a blog about movies and TV shows is that one must watch those movies and TV shows before talking about them. Then, there’s also the issue of choosing which of those to talk about or not for reasons totally arbitrary (after all it IS my blog). Yesterday (Sunday) night “The X-Files” came back from the limbo it has been staying for the last 14 years, and man was it GLORIOUS. It may be nostalgia and a bit much excitement talking but before going deep into that episode, let me take a few weeks back. You know there are some TV shows that are embedded in the American culture, like Seinfeld (don’t ask, I haven’t watched one episode of that show). And although the reach of “The X-Files” was far greater than the likes of Seinfeld, my childhood memories involving the beloved TV show were nothing but a blur. I then decided to binge watch the entirety of the 9 seasons available on NETFLIX. And man did I like it. “The X-Files” broadcasted between 1993 and 2002, is in my opinion one of the best show to have ever blessed American TV. A sound mix between the “monster of the week” formula and the thematic of the unstoppable, relentless pursuit of the truth has marked more than one generation of TV viewers. The shows centers on two FBI agents, Fox Mulder (David Duchovny) and Dana Scully (Gillian Anderson) and their stories as they investigate occurrences of seemingly paranormal activities. Mulder is tagged with the oh-so-popular line “I want to Believe” which refers to his willingness to believe in aliens and paranormal activities. Scully on the other hand is a scientist, a physician (doctor) who approaches every of those situations with the lenses and gloves of scientific logic. The team is as incompatible as it reads but has managed to solve somehow one case after the other until they dropped out of the FBI at the end of the 9th season. So when the news of the revival made noise last year we were all anxious to see if the series would retain the same magic that made its popularity. And last night episode was all that we expected, as a proof, the #Xfiles became a trending topic worldwide before the first commercial break, and despite the Sunday night football event eating at its time slot. 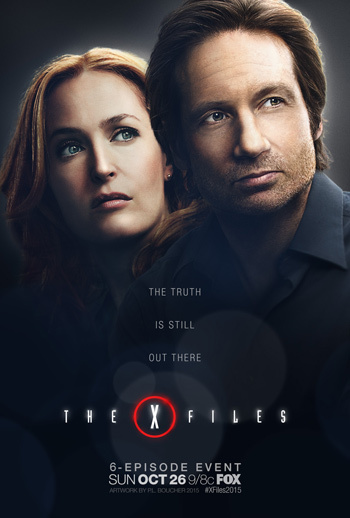 In that same period, we heard the familiar and eerie title sequence that is so recognizable now, we head the words ‘Government Conspiracy’, ‘Alien, Mulder, Scully, Skinner’ and it was enough for people who loved the show 14 years ago to feel like everything was right again in the world. But if we had to be objective, the episode in itself was nothing near perfection. The actors had a hard time making some plot points sound logical and if it wasn’t for the familiar sense of belonging the score and the set gave us, we would have noticed it right away. So like always, Mulder is brought back to live by an internet celebrity’s search for the truth which leads him to find a seemingly truth he is once again willing to sacrifice everything for: classic Mulder, “The truth is out there” isn’t it? And in his frenzy to expose this new truth, he embarks Scully into new adventures filled with conspiracies and monsters in a six-part TV event. The one thing that was actually well executed was the side eyes, and the shades from Mulder and Scully, hinting at the fact that for a moment within those 14 years away from our screens they were a couple. So, just like the rest of some of America, I patiently wait the next episode hoping that, in the trend of revivals, reunions, reboot and remakes, “The X-Files” goes to in the “That was a great idea” column.